Dorrit Black was born in Adelaide, South Australia. Around 1909 she began studies at the South Australia School of Arts and Crafts under Harry Pelling (Pelham) Gill and travelled to England and Europe with her parents in 1911-12. She moved to Sydney in 1915 to study at Julian Ashton's Sydney Art School and began exhibiting in 1916. In mid 1927 she left for England where she began studying lino-cutting with Claude Flight at the Grosvenor School of Modern Art, London and made her first colour linocuts. In December of that year she went to Paris to study at André Lhote's Academy, interspersed with travel around Europe, where she studied with the Cubist Albert Gleizes and met the inspirational art educator Franz Cizek in Vienna. She returned to Sydney late in 1929 but kept in close contact with Claude Flight for a decade after her return. This is a view of Wynyard Square, Sydney. It is adjacent to the site of 'The Modern Art Centre' which Black established and ran briefly from 1932-33 at 56 Margaret Street. 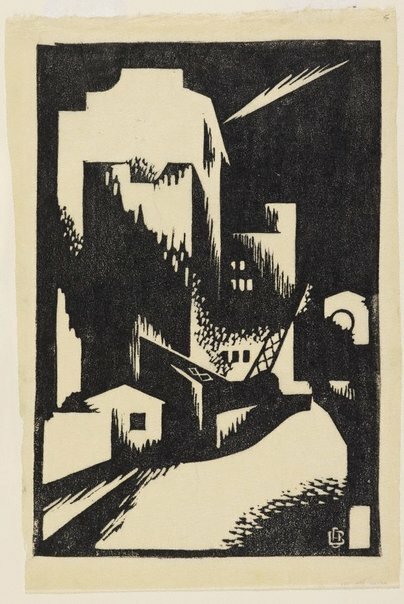 This print was illustrated in Harry Tatlock Miller's Geelong-based modernist literary and art journal Manuscripts in November 1932. Other titles under which it was exhibited include 'Wynyard Square' and 'Reconstructions, Wynyard Square'. Signed within block to print l.r., incised "DB [monogram]". Not dated. Helen Campbell, Colour, rhythm, design: wood & lino cuts of the 20s & 30s , 'Introduction', pg. 2, Sydney, 2010, 16 (colour illus.). Martin Terry, Sydney moderns: art for a new world , 'Modern destinations', pg. 132-139, Sydney, 2013, 132, 189 (illus. ), 217, 310, 320,. Sarah Thomas, Art and Australia (Vol. 44, No. 1) , 'A wider vision: Dorrit Black's Modern Art Centre', pg. 98-103, Sydney, Sep 2006-Nov 2006, 98 (colour illus. ), 99. Linocuts of the machine age: Claude Flight and the Grosvenor school , 'The Australians: Dorrit Black, Ethel Spowers and Eveline Syme', pg. 65-68, England, 1995, 156 (illus.). cat.no. DB 16; NOTE: this is not the AGNSW impression. Masterpieces of Australian printmaking , Sydney, 1987, 12, 13 (illus.). cat.no. 10; NOTE: this is not the AGNSW impression. Dorrit Black: unseen forces , Catalogue entry (no catalogue numbers), Adelaide, 2014, 202 (illus.). NOTE: this is not the AGNSW impression.